This deeply spiritual tale is the long-awaited sequel to "Promises." Casey Curry is an award-winning author and the director of creative writing at a fine arts magnet school in Tampa, Florida. Learn more about Casey’s books. She is the author of two books: one nonfiction and fiction. She is also the author of the soon-to-be-released sequel to Promises, A Pillar of Fire. Get in touch with Casey to speak at your event. Casey is also available to Skype into your book club chats or appear on your radio or TV program. Author Casey Curry will be leading a book talk at the Robert A. Saunders, Sr. Library in Tampa, Florida on Saturday, January 5, 2019, 2 pm - 4 pm. WHEN THIS LIFE ENDS DOES ANOTHER BEGIN? Long departed patriarch, Jonas Sloane weaves a timeless narrative of intrigue, love, and desire. "Curry teaches us about the military, the real black middle class, and the Naval Academy while sharing about family, love, commitment, jealousy, and betrayal." 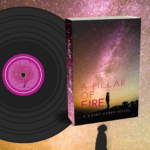 "A Pillar of Fire" is such a cozy story. The characters and storyline are fitting for an evening of hot tea and comfort." "Promises was an amazing read! Not only did I not want to put the book down, but I fell in love with the storyline and could connect with the characters. Such a well developed plot. Promises does not disappoint!" "The novel was spell binding. It was fast pace and exciting. I could not put it down. I had to know what happened next. The book showed true emotions and the relationships within a family. An excellent read." Copyright © 2019 Casey Curry. Powered by WordPress. Theme: Spacious by ThemeGrill.